The door is open in Newark, NJ. Friday June 29th 2018, first ever show for the band at the Prudential Center, Newark, NJ and last show but two of this North American leg of the #U2eiTour. All Because Of You returns to the set after missing one show, and it felt like everyone in the room joined together for a very moving version of One, dedicated tonight to journalists and reporters and victims of the shooting at the Capital Gazette in Annapolis, MD. Here's the set list. 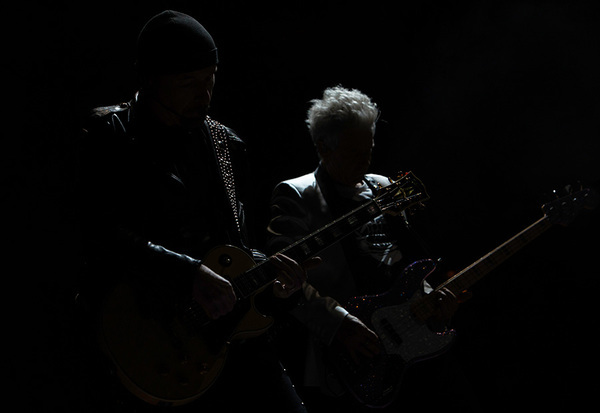 Harry Kantas from @U2Songs was at the show and sent us a few reflections. 'The iNNOCENCE and eXPERIENCE theme has been running deep and on multiple levels for the past 3 years. The Innocence Tour in 2015 was about the familiar, the memories, the losses, the gains, the sparks, the fans - your main source of energy, and the songs that came along over the years, that reminded you why you're still around. The Joshua Tree 2017 Tour came to visit that place in time where everything changed. Overnight. And you had to figure out how to handle the changes for yourself, there was no instruction manual. Not in your language, anyway. @U2gigs also posted up a roundup of the day. The Newark Prudential Centre (@PruCenter on Twitter) itself had photographers at the show and have a gallery from the night presented on their Facebook page. If you were at the show in Newark, add your own reviews and photos.